Patchouli is a member of the Lamiaceae family which includes Mint, Oregano, and Lavender. While most members of this family have their roots in mild, balmy Mediterranean regions, the 40 some species of the Pogostemon genus are found mostly in China and Indonesia. Of these 40 species, only two are used to make the pungent, dark amber colored Patchouli oil. They are Pogostemon cablin and Pogostemon heyneanus (which is sometimes referred to as Java Patchouli). P. cablin is the species most often used as a crop in Indonesia. There it is grown as an understory, or secondary plant in teak wood forests. It is from this use that we gain an understanding of the needs of the plant. Protected from the hot sun by the towering trees above, Patchouli thrives, growing to three feet. It can be cropped twice a year and is usually replaced every three to four years. The dappled light through the trees provides the appropriate balance of sun and shade that this plant loves (it can be grown in more sun, but the water requirements significantly increase). 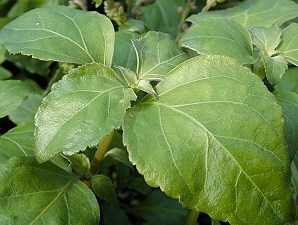 However, most of us in the US have to enjoy Patchouli either as a house plant or as an annual. Because it grows quickly, both of these options are viable. Patchouli is perfect for shady spots where it can lend its fragrance to those who pass by. According to Joannah Metcalf in Herbs and Aromatherapy, Patchouli can be an anti depressant for those who like the smell and she even hints that it might be an aphrodisiac. So, situate that love seat in the middle of that shady spot and get that Patchouli growing. "Step into my parlour?" said the Spider to the Fly.